Collagen, the most abundant component in mammalian tissues, has a crucial impact at skin level. Both promotion and maintenance of cross-linked collagen at the skin are critical to sustain the functionality and appearance of that tissue. Lysyl oxidases, also known as LOX enzymes, are the major collagen cross-linking enzymes that play a pivotal role in homeostasis. This minireview summarizes evidence that describes an amino oxidase-like activity, which could be attributed to polyphenols, or where polyphenols could be required. 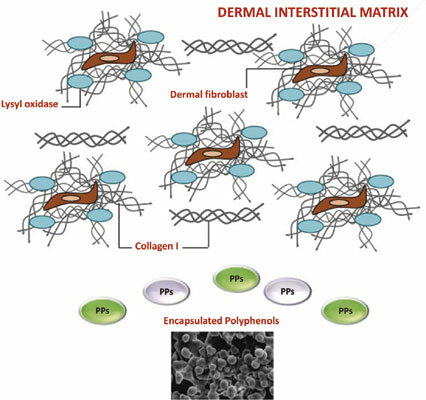 We also discuss some available collagen formulations and the scientific evidence that describes the impact on dermal extracellular matrix. In addition, information about encapsulation strategies to carry polyphenols, and some examples are also provided. Polyphenols, Flavonoids, Lysyl Oxidase, Basement membrane, Collagen, Skin, Aging, Extracellular matrix, Dermis, Encapsulation.